Kim Hyun Jung, South Korean actress and artist (left) and South Korean actress Jang Seo-hee holding the portrait of Jang Seo-hee by Kim Hyun Jung. An exhibition that features three South Korean artists' works ranging from traditional to contemporary art is now being held at the Today Art Museum in Beijing. Of the 33 artworks, the paintings by Kim Hyun Jung, a model and actress-turned-artist, captured the highest level of attention. As soon as Kim Hyun Jung made a public appearance at Beijing's Today Art Museum, her smile was so impressive that it made people feel like a warm summer breeze. Kim Hyun Jung used to work as a model and actress, but now she tries to contribute as much as possible to charity. Her regular visits to a local orphanage have also become a source of inspiration behind one of her paintings called "The Baguette Cross." "There are many orphans in the shelter, but they couldn't sleep because they are very concerned about the hunger they might suffer. They put bread beside their bed so that they can sleep. I want to tell people we can comfort the disadvantaged group of people with these small things." In this painting, a lovely bunny looks eager for a piece of bread made in the shape of a cross. Kim named this cartoon rabbit Lala, which she says represents her inner child. Besides "The Baguette Cross," Kim's painting of famous South Korean actress Jang Seo-hee or Zhang Rui Xi in Mandarin Chinese has also garnered a lot of public attention. According to Kim Hyun Jung, the proceeds from the sale of this portrait will go to charity. "Zhang Rui Xi wants to contribute to the society culturally. She suggested selling her portrait and donating the earnings to the public. She invited me to paint her; I used two techniques in this painting; one is painting on double layers. I emphasized a small part of the drawing. I wanted to create harmony between the embroidery and the colors in the painting." Curator of this exhibition, Peng Feng, thinks that Kim Hyun Jung created a neo-classic style, which incorporates realistic fine techniques with pop art elements. 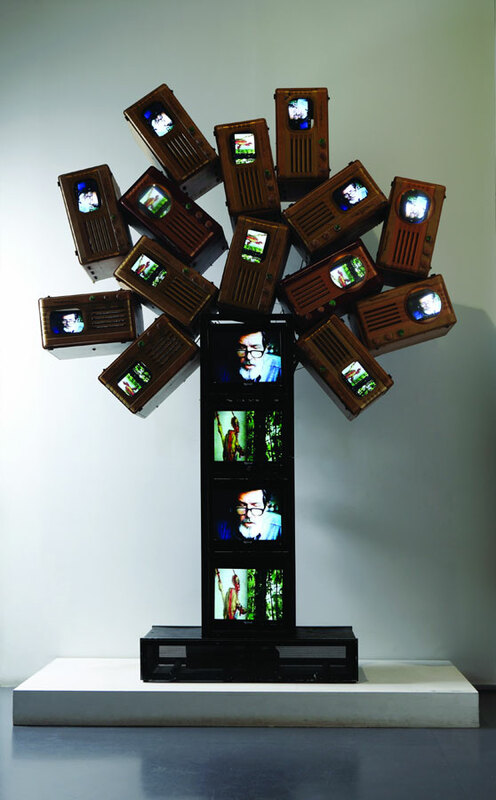 In addition to the artworks in the neo-classic style, the exhibition also contains traditional Korean art in terms of huge video installations made by late internationally recognized contemporary artist, Paik Nam June. Meanwhile, Lee Wal Chong's paintings are remarkable in their modernistic characteristics. Peng Feng, a professor at Peking University's School of Art, expects visitors may understand the well-preserved ecology of Korean art through this exhibition. "I want to design an exhibition which comprises the contemporary art of South Korea, as well as the modern and tradition art of the country. So I named this exhibition "One Divided Into Three" on the belief that today's art industry in South Korea is composed of the genres of traditionalism, modernism and postmodernism. Visitors to the exhibition may re-value the contemporary Chinese art from a new perspective." "One Divided Into Three: The Exhibition of Three Korean Artists" will run until November 19th.